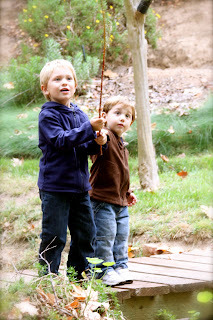 Last Friday, I drove down to Lindsay's to photo my favorite little boys, Lex & Matteo. I was totally enamored -- and fell in love all over again (I tend to do that with children!). They are very well behaved and have creative and playful personalities (though Matteo does tend to be the more serious one) and thanks to Lindsay, Ann, & Aaron, who helped keep them entertained, I was able to get some pretty dreamy shots that I was very happy with! I had trouble towards the end of the shoot because we were losing the light quickly; it was already a gloomy day and we started the shoot at about 3:30. Many shots were turning out slightly blurry. Next time I will experiment with the ISO so the camera will capture the image a little faster (several photos I rendered unusable because of the blurry factor -- too bad, in many cases). At one point, we got the boys to pick flowers and bring them over to me -- Lindsay grabbed my camera for some adorable shots of the boys putting flowers behind my ears. It was a moment I'll never forget! Thank you, Lindsay! *It's all about the eyes! Get to their level and focus on the eyes. *Use the help of the family to keep them entertained! It really works! *Do not attempt to pose little ones. In general they will get upset and not want to stay. *Keep them in a good mood! Once crying begins, they remain irritated for the rest of the shoot. Keep them happy! *Children are best photographed when they're in their own environment or one where they feel most comfortable. Keep this in mind. With Matteo -- what a darling boy!